Blizzard thinks that DotA is owned by the community, not Valve. Earlier this month, Valve announced plans to release its own version of the popular Defense of the Ancients mod called DotA 2 in 2011, and filed a trademark to own the name in August. This trademark has been challenged by some of DotA's original creators that believe nobody should have the rights to own the property. Today, Valve has another much bigger challenger in the form of Blizzard Entertainment, which doesn't think trademarking DotA is the "right thing to do." Blizzard vice president Rob Pardo recently spoke to Eurogamer about the issue and said: "To us, that means that you're really taking it away from the Blizzard and Warcraft III community and that just doesn't seem the right thing to do." Pardo is referring to the fact that DotA originally was created using the Warcraft III map editor. 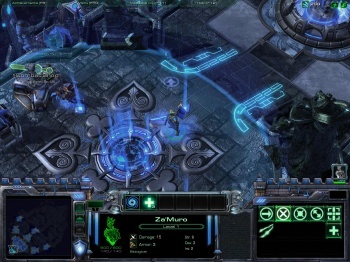 In addition, this opinion is likely influenced by the recent announcement that Blizzard is creating its own form of DotA for StarCraft II. Pardo also says he is "confused" that a completely separate company would try to trademark DotA. "Certainly, DotA came out of the Blizzard community," he added. "It just seems a really strange move to us that Valve would go off and try to exclusively trademark the term considering it's something that's been freely available to us and everyone in the Warcraft III community up to this point." If Valve were to challenge Blizzard on the use of DotA for its upcoming StarCraft II gametype, Pardo says: "Our response is that they don't own the term DotA at this point, it's something that they're filing for. Our contention is that it should continue to be available to Blizzard and to our community." Considering how large these two companies are I would expect that Valve has already heard about Blizzard's thoughts on the matter. Unless Valve really wants to trademark DotA and keeping silent is a necessary part of that, a response is likely coming soon. To me it seems like a touchy issue, because Valve should be able to produce a professionally created version of DotA, and studios usually have to protect their investments by trademarking game names. What do you think: Should any single company be able to own the DotA name?